Rome (AsiaNews) - The bishop of Wenzhou (Zhejiang), Msgr. Pietro Shao Zhumin, was kidnapped by police this morning at 9 and will be kept away from the diocese for "10 or 15 days". Usually such forced seizures are defined by the police as "vacation periods". They are actually periods of interrogation and indoctrination. The faithful of the diocese have invited all the communities and the Church in the world to pray for the bishop. Msgr. Shao, 55, belongs to the unofficial community, not recognized by the government, but he is recognized by the Holy See as bishop of Wenzhou. In the last two years, he has been taken away by the police at least 5 times. The last time was in May 2017, he was only released after 7 months. 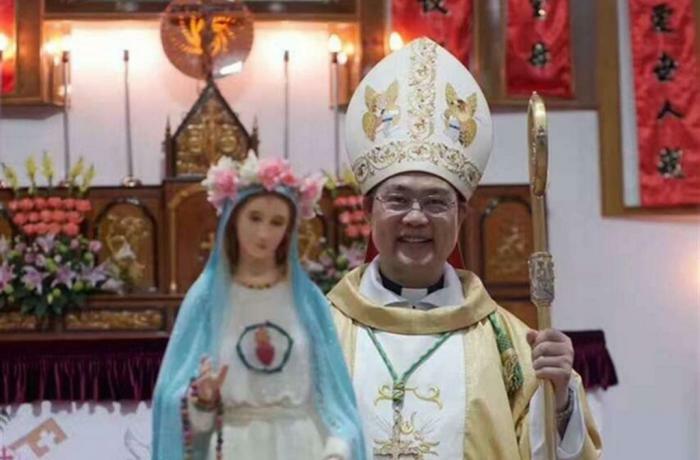 As an "underground" bishop, in the periods of kidnapping he is coerced to submit to the religious policy of China, which requires registration with the government and membership of the Patriotic Association (PA). But membership of these bodies implies adhering to the project of an "independent" Church [from the Holy See], which Msgr. Shao refuses. The Letter to the Chinese Catholics of Benedict XVI also judges the status of the PA as "irreconcilable with Catholic doctrine". Despite being an "underground" bishop, Msgr. Shao is also appreciated by the official community The Catholic community in Wenzhou has about 130 thousand faithful, more than 80 thousand members of the unofficial community; there are priests 70, divided equally between the two branches. For decades the Wenzhou Church has been strongly divided. But now the two communities work together. In the United Church of Wenzhou, even the official priests are subject to restrictions and controls. During the octave for the souls of the dead, official priests were forbidden to visit the tomb of some underground priests and bishops, highly esteemed by all the faithful. In the official and unofficial churches, on Sundays, the police forbid minors under the age of 18 to enter the church and ensure that there is no Sunday catechism. After the agreement between China and the Vatican on the appointment of bishops, the PA has stepped up controls and the persecution of underground communities, and reiterated in the meetings with the official clergy that the Chinese Church remains "independent", despite the agreement.